For years, the animal rights movement, scorned by both politicians and the public in the land of foie gras, struggled to gain traction in France, Europe’s biggest producer and consumer of red meat, where one billion animals are slaughtered a year. 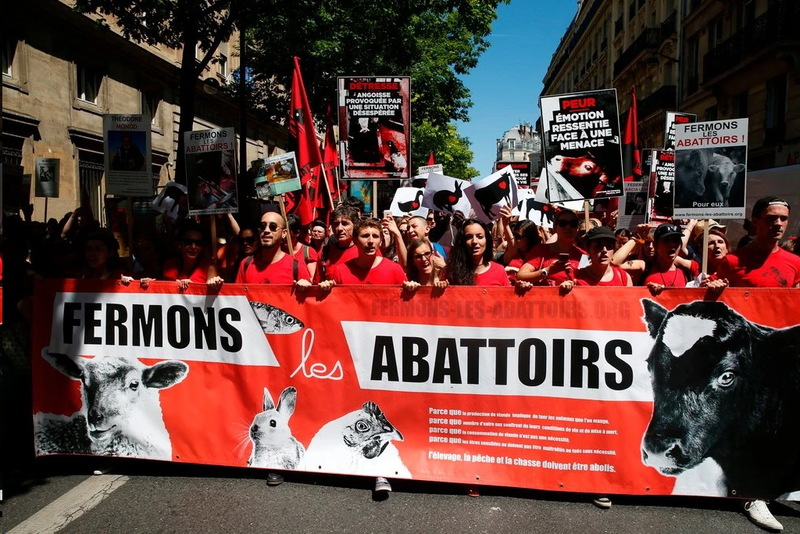 “Animal welfare has never really been a crowd-pleasing cause among French politicians, although the public agrees that animals shouldn’t be mistreated,” said Sébastien Arsac, co-founder of one of the country’s most vocal animal rights organizations, L214 Éthique et Animaux. So when Mr. Arsac and the organization’s other co-founder, Brigitte Gothière, heard Emmanuel Macron, now president, pledge basic safeguards for animal welfare during the 2017 election campaign, they thought they had found an ally. Mr. Macron promised to set up closed-circuit televisions in slaughterhouses and to ban the sale of eggs from caged hens by 2022, two of L214’s top priorities. But while French lawmakers are debating a law on agriculture and nutrition, Macron’s government has watered down the former campaign promises, dashing L214’s hopes that they could make inroads with the support of political leaders. So its activists, taking a page from the playbook of similarly minded groups in other countries, including the United States, are stepping up a campaign of guerrilla tactics, hoping to shock the Parliament into amending the government’s proposed law. They recently released a series of clandestinely recorded videos that showed the lack of hygiene on huge egg farms, and the appalling conditions in which distressed hens are kept, plucking out one another’s feathers and trampling on rotting corpses in their cages. The inspiration for these videos was Henry Spira, the Belgian-American activist who began championing the cause of animal rights in the United States nearly 50 years ago. Mr. Spira sought to talk to companies and institutions first, but if that did not work, he would resort to exposés of animal mistreatment in shocking newspaper ads and other public campaigns. Ms. Gothière and Mr. Arsac said their organization was part of the activist’s legacy (Mr. Spira died in 1998). They founded L214 in 2007, naming it after the article of the French rural code that defines animals as sentient beings and that requires their owners to treat them with respect. With 50 employees and 2,000 volunteers throughout the country, the organization has tried a mix of working with companies or institutions, and pressuring them through bad publicity when negotiations don’t work. While broadening public awareness, Ms. Gothière and Mr. Arsac have so far had only modest concrete victories. Their group forced two of France’s 263 slaughterhouses to shut down after it shared a video showing thrashing horses, cows and sheep being slaughtered while semi-conscious. 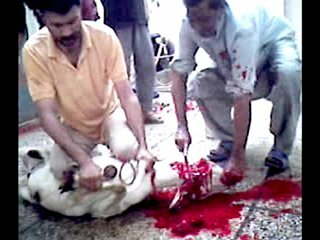 The public outcry compelled the government to investigate the country’s slaughterhouses and to acknowledge problems in 30 percent of them, including unsafe workplace conditions and a failure to follow slaughtering rules. One of the group’s most recognizable campaigns targeted the premium foie gras producer Ernest-Soulard, which they accused of mistreating geese in a 2013 video that showed many of the birds looked distressed and hurt. In the first-ever trial of a producer of foie gras accused of crueltyagainst animals, Ernest-Soulard was cleared of any wrongdoing. But acclaimed chefs, including Joël Robuchon of France and Gordon Ramsay of Britain still stopped buying the delicacy from the company. The Australian philosopher Peter Singer, who was a friend of Mr. Spira, is publishing his biography of the activist in French in May. Over the past two years, L214 has pushed dozens of French supermarket chains and cattering companies to commit to stop selling battery-cage eggs by 2022 or 2025. Across the world, including in the United States, large food companies have committed to transition to cage-free eggs only. Yet L214’s methods have failed to convince politicians, and their demands have angered many who see in animal products a vital component of France’s culture and economy. “The animal industry didn’t wait for L214 to tackle animal welfare,” said a lawmaker from Macron’s party, La République en Marche, and the commissionner of the agriculture and nutrition bill, referring to efforts by the livestock industry to improve animal welfare. In many ways, Macron’s backtracking is hardly a surprise. French farmers are under increasing economic stress. There has been a quiet epidemic of suicides in recent years, with hundreds taking their own lives, leading the Ministry of Agriculture to make the issue a national cause. Unlike several other European countries, such as Portugal, Spain and the Netherlands, France does not have political parties that have made animal welfare a priority. As a sign that L214 is fighting an uphill battle against politicians, a majority of lawmakers have chosen to ignore the organization’s call for CCTV in slaughterhouses to defend those who work there. “What kind of downward spiral are we going to have if we start filming the employees?” Sandrine Le Feur, a farmer and lawmaker of Mr. Macron’s party, said on the television channel LCP. So far, Britain is the only European country with plans to make closed-circuit TVs mandatory in all slaughterhouses by 2018. A former slaughterhouse manager and farmer who divides his time between the Parliament in Paris and his farm in the Creuse area of central France, where he has 100 cows, said he refused to negotiate with L214, which he called an “extremist organization” that looked to harm farmers with “fascistic methods.”“The end of animal farming would result in the extinction of any life in the countryside,” he said. His criticism of L214 echoed a widespread animosity among meat professionals, who argue that the practices the organization denounced represented a tiny minority of slaughterhouses. “L214’s cause isn’t animal welfare, but the abolition of animal farming,” said a director of Interbev, a national organization of meat and cattle professionals. Indeed, L214’s ultimate aims would be revolutionary in a country that so cherishes its meat. Ms. Gothière said that only a vegan society would amount to success, but that small steps were progress.